The Kity 419 circular saw bench comes as a complete package, with leg stand, sliding carriage side table extensions, wheel kit and lifting handle. Like all the other Kity machines I've tested there's some assembly work to be done. The leg stand is common to all the machines and just requires a few bolts to put it together with the spanners and Allen keys provided. to the stand and it's ready to use with the 18-tooth blade ready fitted and lowered into the table for safety. 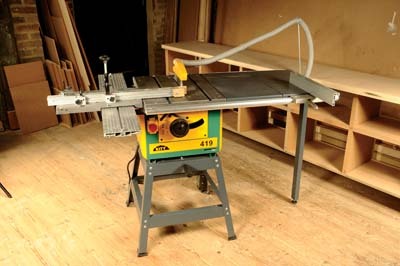 The saw will cut up to 150mm wide without the extension table fitted and up to 600mm with, which is useful for sizing panels. The extension table is simple to fit, only requiring the standard fence rails to be replaced with the longer ones provided and the tables to be attached. A support leg is provided with an adjustable foot to stop it toppling over. Although the support is rigid, operating the machine outside its limits is not recommended. 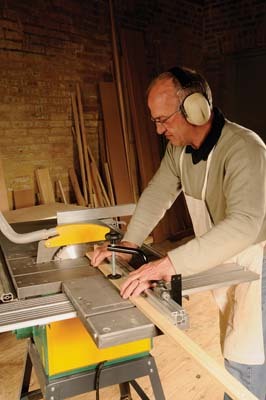 The sliding carriage is also easy to fit, with plenty of adjustment to get it flush with the table and square with the saw. This works very well when used to cross cut timber and panels to length, the fence is also adjustable up to 45 degrees and comes with a movable stop for repeat cuts. 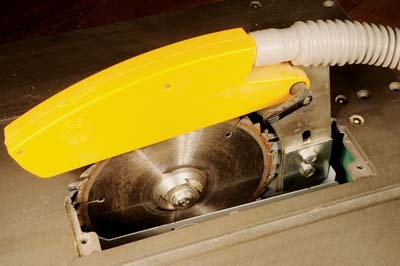 In use the saw is fairly quiet and smooth running but lacks power when cutting at its maximum depth of cut, which is 60mm. If a steady feed rate is used it will cut at its maximum although a proper rip blade would probably help. The fence is the usual aluminium attached to a fairly substantial support with a good positive lock and no noticeable flex. A magnifying glass is incorporated to view the measuring scale with. 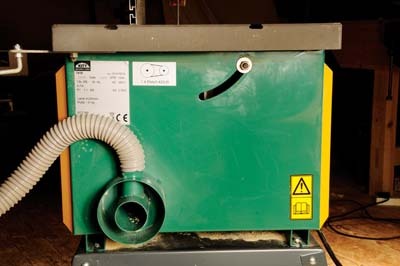 The saw can be lowered into the table and canted over to 45Âº with a single hand wheel and lock. It will cut small panels well but again could do with a more suitable blade for fine cross-cutting and panel work. One problem I did encounter was the whole saw assembly moving across the floor when cutting larger materials. It may need fixing down to the floor to stop it moving but this compromises its portability. It's also very wide when fitted with the sliding carriage and side extensions. 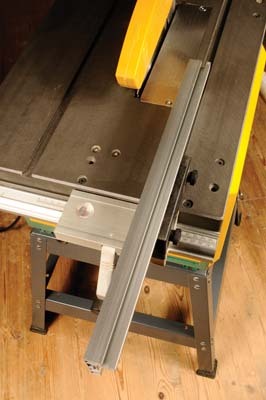 A roller stand or extension table is needed for longer cuts. The extraction works well when connected to an extractor. 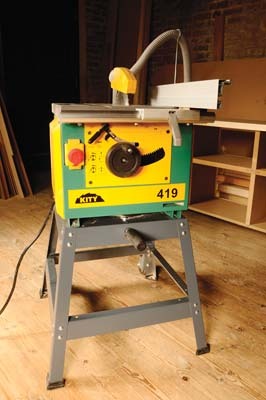 All things considered the 419 is a useful small saw bench for the home workshop if used with care when cutting larger sections to avoid stopping the blade. I took delivery of this machine, a planer/thicknesser and spindle moulder from this range more than nine months ago. They have been in constant use and although in my opinion not suitable for prolonged professional use they have proved to be reliable. On occasions I have found them to be lacking in power so they will not suit a workshop converting large sections. If on the other hand your requirements lean towards small joinery components you will find them useful and an affordable way of kitting your workshop out with separate machines. Extraction port: 50 and 25mm dia.